I previously posted about limited palettes containing just 6 bright colours here. While I don't use such limited palettes myself, I really enjoy the challenge of working through them. 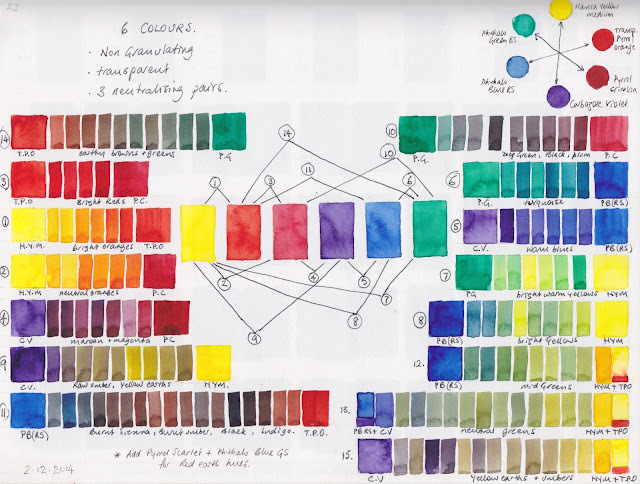 It is also very helpful when those on a limited budget are trying to get started in artist quality watercolour - they can start with just a few but still mix an amazing range of colours. This palette of six colours is transparent and non-granulating. It contains the full gamut of yellow, orange, red, purple, blue and green with no earth colours so you have to mix them yourself. It is made up of three neutralising pairs of single pigment colours. You need a pretty good understanding of colour to work with these palettes if you are going to successfully create all your earth hues as well. You also need a decent mixing space. They are great fun to explore. Other explorations you might find interesting. Ultimate Mixing Palette - palette of 14 paints, 15 colours.